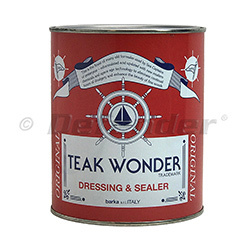 TEAK WONDER® DRESSING AND SEALER is a safe and durable, non-oil based product which provides a pleasant golden color without darkening the teak or producing that fake colored look. If New Teak, it is recommended that (2) coats of TEAK WONDER are applied (with heavy brush strokes). If Teak is old and dirty, then the wood should be previously treated with TEAK WONDER® CLEANER and TEAK WONDER® BRIGHTENER. Brush Width: 1", Trim Length: 2-1/8", Thickness: 7/16"